Fit Fluential Mom: My Latest Favorite Gadget! The Foreo Issa Hybrid! If you know me, you know I love my gadgets! Gadgets for the kitchen, the RV, my workouts and especially beauty gadgets! Not much of a make up kind of girl but I enjoy trying out new gadgets that help with hygiene, skin care and dental care! White, clean, healthy teeth are a must and I've been on the hunt for a really good electric toothbrush since I bought my first one about 10 years ago. In that time span, I've tried pretty much every type of Sonicare, Oral B and Phillips electric toothbrush and I haven't been too impressed with any of them. One of my biggest pet peeves is the battery life. It only lasts a few uses and I always had to keep the charger on my bathroom counter tops which, for this OCD girl, is not a good thing! Other pet peeves were the head softening up in just a few weeks and needing replacement and water and mold collecting between the head and the base no matter how much I rinsed it. So, with that said, I've been on the search for a solid electric toothrush for SOME time now and I was elated when I came across the FOREO! It has a unique design that's much more compact than the typical electric toothbrush and they make different versions of it for every member of your family! I have the ISSA Hybrid but they also carry a standard Foreo ISSA and even an ISSA Mini for kids that I can't wait to check out too! That's next on my list of gadget purchases! So, why do I love this toothbrush so much and plan on getting one for each member of my family? Here are just a few of the reasons! 1. One of my favorite aspects is the battery life and charge time! Where as most electric toothbrushes have to be charged up every few days, the FOREO ISSA lasts for up to 365 uses! If you brush two times per day, this means you only have to charge it twice a year! Say what???? That makes this girl SUPER happy. Charger is put away beneath the sink and I can keep my toothbrush in the medicine cabinet until it's next use! Another perk to this is that I can travel with it without having to worry about bringing the charger and cord with me. We travel often so this is a big bonus! 2. The combination of silicone and PBT polymer bristles in the ISSA Hybrid is something I've never tried in a toothbrush before and at first, I wasn't too sure how I'd feel about it. But after trying it, I love the way it feels and cleans my teeth and so do my kids after trying mine. 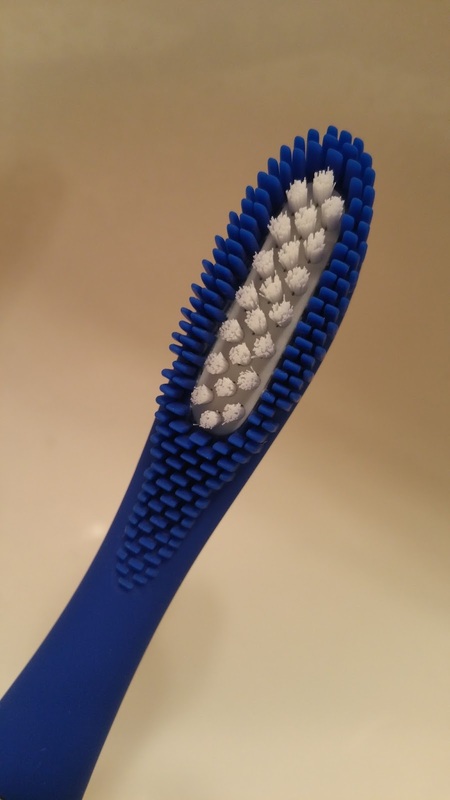 The silicone bristles are not as abrasive as standard bristles on electric toothbrushes yet they're effective in cleaning teeth without damaging the gums. The silicone bristles are also a better choice hygienically when compared to standard bristles because they aren't porous and harbor less bacteria due to their natural properties. 3. The ISSA Hybrid's design is another favorite. 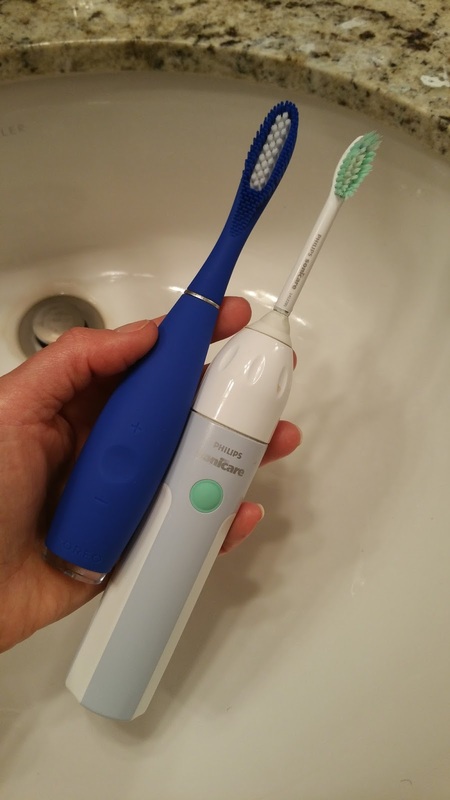 It's much smaller than the other electric toothbrushes on the market today and easier to hold. It is also designed in a similar fashion to dentist tools where the top comes off easily with a pull and there's no gap or area for water or mold to collect. 4. One of the main reasons to get an electric toothbrush is for the vibrations. They help reach deeper around teeth and inside crevices and help loosen plaque. With most standard electric toothbrushes, there are just one to three settings at most. The ISSA Hybrid has 8 levels of intensity so you find your level of comfort easily with the + or - buttons on the base. The ISSA Hybrid will even remember your preference for the next time you use it! Another bonus, especially for those of us that can brush our teeth for an hour if I don't pay attention, the ISSA Hybrid shuts off after 3 minutes to prevent overuse. 5. Last but not least, I LOVE that it's completely waterproof unlike my last 2 electric toothbrushes. All you do is seal the charging port and you can keep it in the shower since you don't nee do charge it for up to 6 months! Now that is something that really sold me on it since I brush my teeth in the shower 90% of the time! So, for those of you looking to check out a new gadget and especially if you care about your dental hygiene (and really, how can you now???) give the FOREO a try! You'll save a lot of time and money too since the heads only need to be replaced once or twice per year where as the others need replacing every few months, if not more often! For 15% off PLUS free shipping to check out any of the Foreo ISSAs or ISSA Minis, use ISSA05BB through June 30, 2016!